Want to show off your log home in its full glory? We do too! With our log home pressure washing and protecting services, you can take years off your home’s exterior and accentuate its natural beauty. Our eco-friendly cleaning formula will eliminate mold and mildew from your wood without hurting your plants, pets, or log siding. At Renew Crew of Topeka, your satisfaction is out top priority. Renew Crew stands out in Topeka because we clean and protect your wood without the use of harsh cleaning chemicals that are not made for natural wood. These products can bleach your log home and leave it susceptible to long-term damage. Renew Crew of Topeka utilizes a safe, environmentally friendly foam for all pre-treatment services. This foam has been specially formulated to loosen deep-set dirt without the use of abrasive cleaners. From surface grime to grey wood and hidden mold, our cleaner will restore your log home from top to bottom. Get the results you want and the peace of mind you deserve when you work with the experts at Renew Crew. Our controlled pressure washing services will clear the dirt from your log home without hurting your wood. Without our deep cleaning foam, you would have to use a higher-powered pressure washer. This would be too powerful for log or cedar home siding, and they can lead to costly repairs. When you work with the experts at Renew Crew of Topeka, you never have to worry about your home. You can sit back and watch as the years wash away from your log home. As part of our 3-step cleaning process, we will coat your log home with a layer of polymer sealant that blocks out water and harmful UV rays. This helps restore the natural sheen of your wood as well so your log home looks as good as the day it was built. Just because a home is older doesn’t mean it has to look that way. 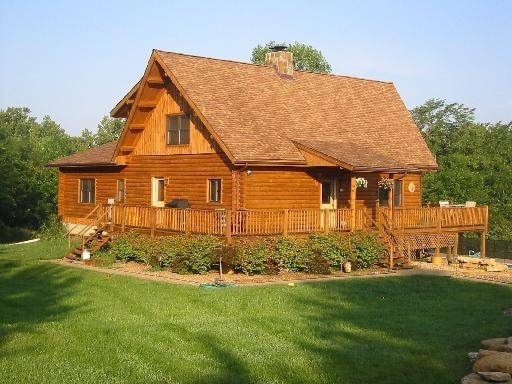 Let Renew Crew of Topeka honor the true beauty of your log home. Call 785-887-6100 to schedule your free consultation.